Get an up-close look at canine anatomy with the only complete guide to the dissection of the dog. 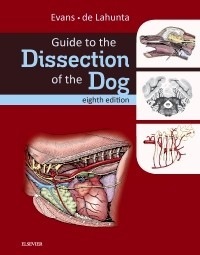 Utilizing detailed descriptions and more than 300 high-quality color anatomic drawings, Guide to the Dissection of the Dog, 8th Edition walks you through how to perform precise canine dissections while developing your understanding of basic mammalian structure and specific canine features. Each chapter offers self-contained guidance on the dissection of a specific body part, allowing you to perform dissections in whatever sequence your choose. Other helpful features include: an emphasis on the anatomical knowledge and terminology from the Nomina Anatomica Veterinaria; a comprehensive list of all figures and tables; and an extensive list of references for further research. In all, this one-of-a-kind canine dissection manual is the resource you need to better understand and review what you are learning in your first-year dissection course. ・NEW! High-resolution digital images have been added throughout the book to provide a clinical context for the drawings and to highlight internal anatomic structures with excellent contrast resolution. ・NEW! Additional transverse sections of the brain give you the anatomic knowledge you need to accurately interpret MR images. ・NEW! Updated figure labels and text adhere to the latest Nomina Anatomica Veterinaria. ・The only hands-on canine dissection guide available reinforces the information that you learn in your mandatory first-year dissection course. ・Body part organization follows the order of dissection commonly taught in veterinary schools and enables you to perform dissections in any sequence. ・More than 300 high-quality color anatomic drawings guide each step-by-step dissection procedure. ・Radiographs, CAT scans and MR images appear throughout the text where relevant to help you visualize internal anatomic features that can only be revealed through these diagnostic methods. ・Comprehensive list of tables and figures makes it easy to find key images and information at a glance. ・Detailed descriptions of anatomical structures ensure the most thorough, precise canine dissections. ・Clear and easy-to-follow instructions guide you in properly performing dissection techniques. ・Option of a digital book on Pageburst offers high-resolution illustrations that are directly linked to the text - letting you search for any text work or anatomic clue and discover any instance of what you want to read more about.